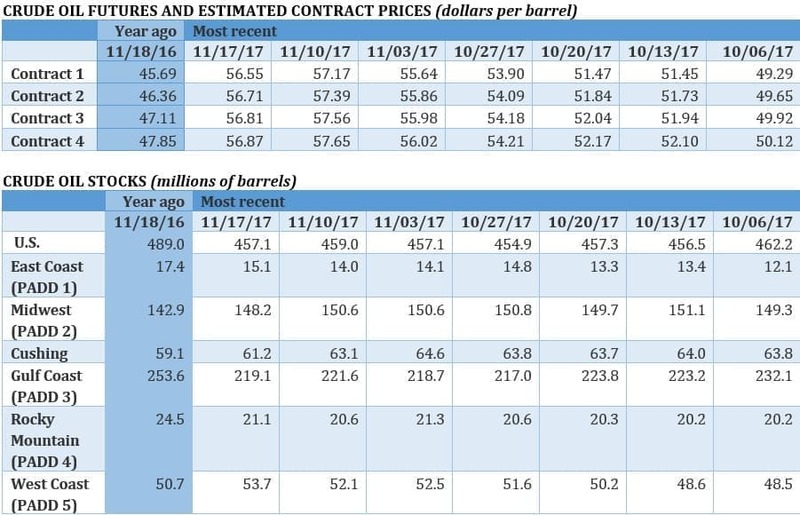 Oil prices saw significant gains on Friday following a week of bullish news and though the OPEC meeting is still a week away, analysts are optimistic and the market is anticipaing an extension of the cartel's production cut. Oil prices rose sharply in early trading on Friday on renewed optimism around an OPEC cut, which came a few days after news that the Keystone pipeline would remain mostly offline for a few weeks. Also, the EIA data from mid-week showed an unexpected inventory decline. Taken together, the news meant that oil bulls were on the march at the close of the week. Keystone spill pushes up oil prices. TransCanada (NYSE: TRP) said that its Keystone pipeline would be offline for weeks, cutting crude deliveries through the 590,000-bpd pipeline by 85 percent. Last week the pipeline spilled an estimated 5,000 barrels of oil in South Dakota, knocking the pipeline offline. After the announcement, oil prices shot up on Wednesday on expectations of tighter supply in the United States. Meanwhile, WTI futures flipped into a state of backwardation, the first time the futures curve has been downward sloping in years. Backwardation could help accelerate inventory drawdowns. OPEC makes progress on deal. No surprise here, but Reuters reports that top OPEC officials are pushing for an extension through the end of 2018 ahead of the upcoming meeting on November 30. “The Saudis are lobbying to have a decision in November for nine months,” a senior oil industry source told Reuters. Russia remains the wildcard, as Moscow indicated in recent weeks that it had reservations about an extension. However, by early Friday, there were reports that Russia was getting close to coming on board. 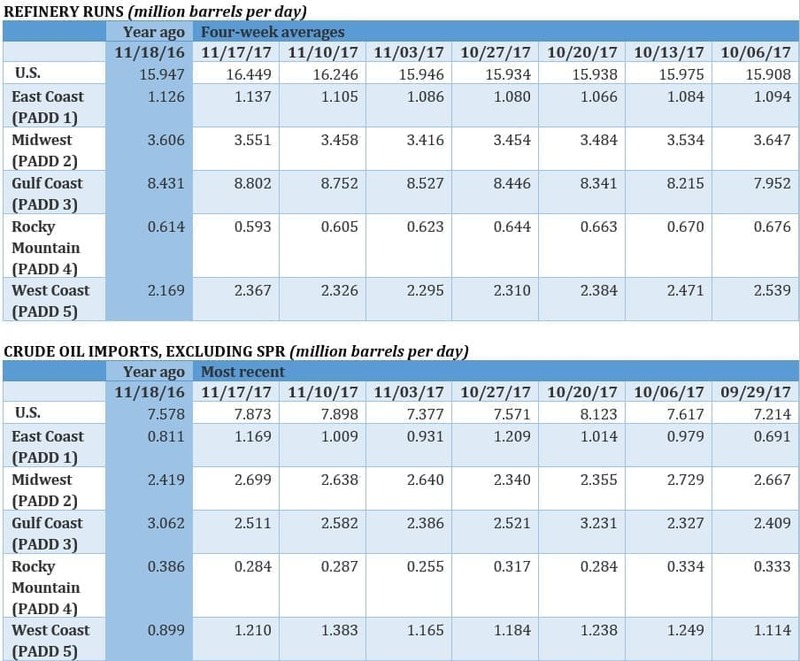 Bloomberg reported that Russia and OPEC agreed to a framework that included an extension through the end of 2018, although crucial details remained unanswered. One idea includes linking the amount of production cuts to the overall supply/demand balance in the market. Another idea would be to make explicit the fact that the deal could be renegotiated early next year in case market conditions change. OPEC officially meets on November 30 in Vienna, where they hope to announce the finalization of some agreement. Rig count climbs for third week. 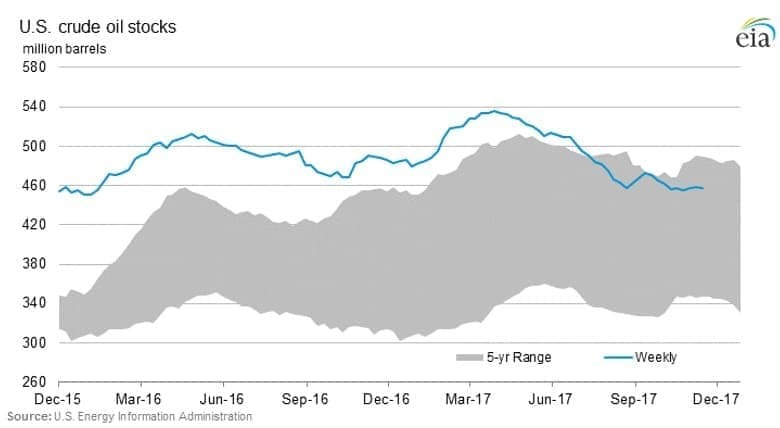 After several consecutive months of sharp declines in the rig count, the U.S. oil industry added more rigs back into operation for the third week in a row. The oil rig count jumped by nine, while the natural gas rig count fell by one. With several weeks of data in the books, there is growing evidence that the rig count bottomed out again, and is now on the rise, moving in tandem with the resurgence in oil prices. The price rally since September seems to have sparked a drilling revival. Exxon, BP, Shell join forces on methane emissions. ExxonMobil (NYSE: XOM), BP (NYSE: BP), Royal Dutch Shell (NYSE: RDS.A) and other are teaming up to target cuts to methane emissions from natural gas production. The collaboration comes as governments are cracking down on methane emissions, notwithstanding the industry-friendly administration in Washington. The arrangement consists of a set of guiding principles that will help drive down methane emissions and improve transparency. Analysts argue that the oil majors want to be seen as part of the solution, no doubt with an eye towards heading off tighter regulation. PDVSA in talks with oil majors for help. Reuters reported that Venezuela’s PDVSA is looking for new funding for oil projects as a way of halting the country’s sliding production. “We are speaking to our allies, with our strategic partners, which are Rosneft, Eni, Repsol, Statoil, and they are willing to continue working with us, to continue financing our projects to boost crude and gas output in the short-term,” Cesar Triana, PDVSA’s vice president for gas, told Reuters. Output has dipped below 2 million barrels per day to its lowest point in three decades. Bolivia inks $1.6 billion in gas deals. Bolivia signed natural gas deals with Repsol, Petrobras (NYSE: PBR), Royal Dutch Shell (NYSE: RDS.A) and Pan American energy, which could lead to $1.6 billion in new investment. Bolivia has been a significant gas supplier to its neighbors, but output has been in decline. Tesla completes installation of world’s largest battery. Tesla (NYSE: TSLA) made headlines earlier this year when Elon Musk promised on Twitter that it could install an energy storage project in South Australia within 100 days or else the batteries would be free. The project was completed ahead of schedule this week, putting 100 megawatts of storage in place to help with the region’s electricity woes. "The world's largest lithium ion battery will be an important part of our energy mix," Premier Jay Weatherill said in a statement. Canada weathering oil downturn better than expected. New data from Statistics Canada shows that the Canadian economy generated C$24 billion (USD$19 billion) more than previously thought between 2014 and 2016, Bloomberg reports. That translates into a GDP growth rate over the three-year period of 1.8 percent, rather than the 1.7 percent that was reported. That could boost the case for an interest rate hike since there is less slack in the economy than anticipated. Alaska drilling tucked into tax bill. The multi-decade fight over allowing drilling in the Arctic National Wildlife Refuge (ANWR) could quickly be resolved if the GOP-controlled Congress approves the massive tax overhaul package. The bill includes language that opens up ANWR for drilling, and it will be taken up by the Senate this week, although the vote could be delayed if the Senate struggles to put together enough votes. The outcome of the legislation is unclear. Some of these 'headlines' (in bold italics before each paragraph of this article) report fairly neutral sentiment (e.g., representing neither a bullish nor a bearish perspective). "Rig count climbs for third week." 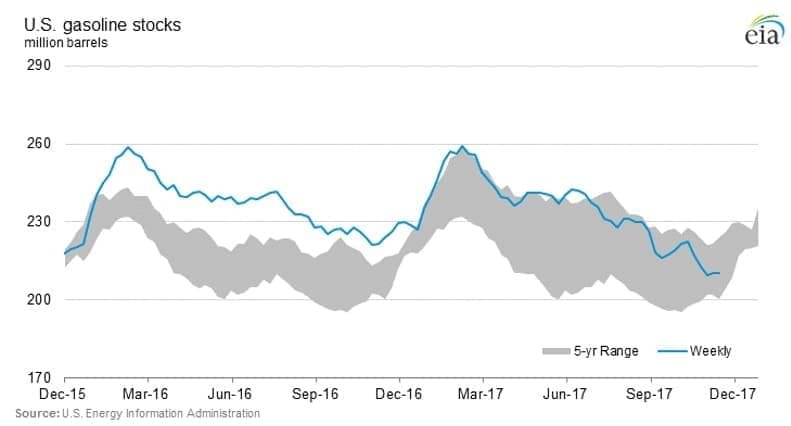 Whenever Baker Hughes reports an increase in the number of oil rigs (usually on Fridays at 12:05 PM Central), this is considered bearish news--NOT part of a "flurry of bullish news" to "boost oil prices". "PDVSA in talks with oil majors for help." "Tesla completes installation of world’s largest battery." So, we are to assume that vehicles using batteries vs. gasoline would be a bearish sign, correct? Well, I suppose we'll all have to wait until Sunday evening or Monday morning (when the casino, I mean market, opens) to see the reaction to all of this!